BOSTON - Dec. 3, 2018 - PRLog -- Rekener (https://www.rekener.com), the Customer Data Platform for B2B, has raised $2.1M of additional capital in order to respond to the increase in demand for Rekener's Sales Rep Scorecards application. Sales Rep Scorecards is a complete sales management solution that automates sales reporting, sales rep scoring, pipeline analysis and one-on-one prep. Sales Rep Scorecards works with Salesforce CRM and HubSpot CRM, and data from other sources, including Google Sheets. "Modern sales leaders need data to succeed," said Alex Laats, Rekener's CEO. "The days when hitting the number was the only thing that mattered are over. Now, sales leaders are expected to drive growth as fast and efficiently as possible." Laats is a serial entrepreneur with a passion for growing businesses using data. His companies have produced $500M in liquidity events for investors and generated in excess of $1 billion in revenue. With sales data automatically rolled up at the sales rep level and the sales team level, sales leaders can easily see what's working and what's not working. Instead of spending time wrangling data in monster spreadsheets or waiting for business analysts to cobble together endless reports, sales leaders can spend their time winning deals and improving sales rep performance. With Sales Rep Scorecards, sales teams save time, see everything and improve results. Rekener's growing roster of Sales Rep Scorecards customers includes Black Duck/Synopsys, Acquia, BookingBug, Zaius, KPA, DC Group and others. "We've always had targets and quotas that we expected reps to hit. But now I can measure their performance on a daily basis" says Erik Lepke, VP of Finance, Profitero. "Rekener allows me to measure performance so quickly, we are never in a reactive state. We're always ahead of the curve." Rekener applications are more flexible and more powerful than any competitive solutions because of Rekener's Customer Data Platform (CDP). The Rekener CDP integrates data from multiple sources, including Salesforce, HubSpot, Marketo, Google Sheets, Zendesk and other sources. Rekener automatically creates a data warehouse in the cloud and transforms data to make it usable. From there, Rekener puts easy to use applications directly in the hands of sales and marketing leaders. In addition to Sales Rep Scorecards, Rekener offers a comprehensive Account Based Analytics application. This round of funding includes participation by Jamie Goldstein of Pillar, Eric Paley of Founder Collective, and Jeff Fagnan of Accomplice. Rekener's executive team and a group of notable angel investors also participated. 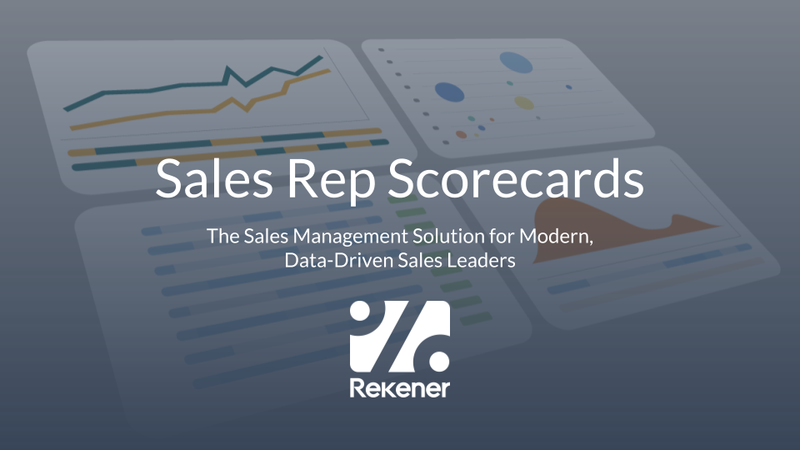 For more info, see Rekener's website at https://www.rekener.com and read about Sales Rep Scorecards at https://www.rekener.com/rekener-sales-rep-scorecards-product. Learn more about automating sales rep reporting at https://www.rekener.com/blog/what-is-a-sales-rep-scorecard .